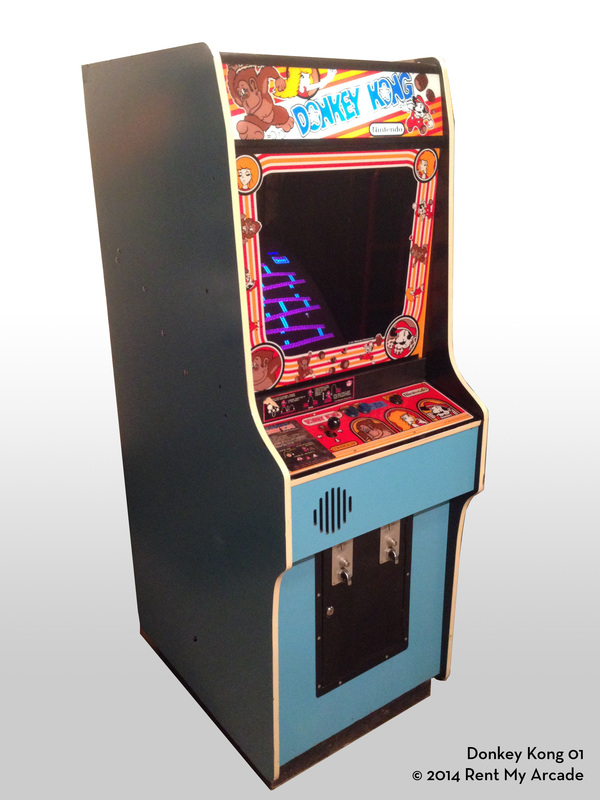 This cabinet comes with either Donkey Kong or Donkey Kong Jr. installed, and includes the appropriate marquee, bezel and control panel graphics for each game. EVERYONE’S GOING APE OVER DONKEY KONG! "Help! HELP!" cries the beautiful maiden as she is dragged up a labyrinth of structural beams by the ominous Donkey Kong. "SNORT. SNORT" Foreboding music warns of the eventual doom that awaits the poor girl, lest she somehow be miraculously rescued. "But, wait! Fear not, fair maiden. Little Mario, the carpenter, is ) in hot pursuit of you this very moment"
Throwing fate to the wind, risking life and limb, or worse, little Mario tries desperately to climb the mighty fortress of steel, to save the lovely lady from the evil Mr. Kong. Little Mario must dodge all manner of obstacles - fireballs, plummeting beams and a barrage of exploding barrels fired at him by Donkey Kong. Amidst me beautiful girl's constant pleas for help, your challenge is to maneuver little Mario up the steel structure, while helping him to avoid the rapid-fire succession of hazards that come his way. H: 67", W: 23.5", D: 33.5"